Stone tools dominate archaeological assemblages from most prehistoric periods in Greece, the organic artefacts being susceptible to decay caused by biological agents and soil acidity over long periods of time. Prehistoric people worked a range of raw materials at their disposal, testing, selecting, choosing or rejecting them according to their abundance, their shape, and their suitability for working. 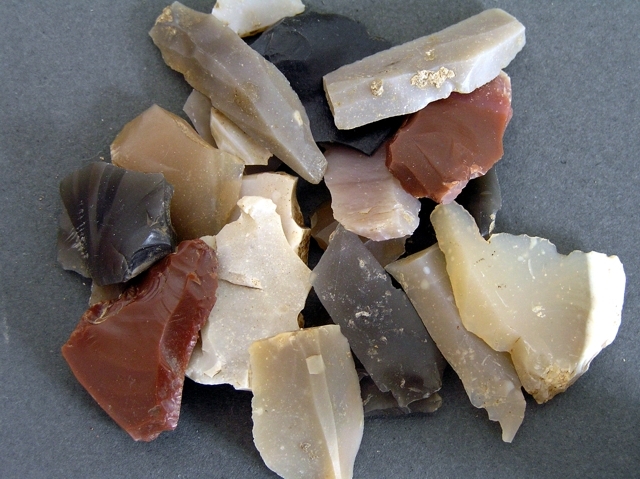 The purpose of knapping chert is to make tools, in the wider sense of the term. The motivation for studying the chipped stone artefacts from Avgi is to investigate the utilization of chert during the Middle to Late Neolithic of this area of Northern Greece. The study aims to provide insight into the site’s organisation and use of space and – in interdisciplinary cooperation with geologist-petrographer Vasilis Melfos - provide data concerning resource exploitation comparable to that from other Neolithic sites from the wider region (Dimitriadis & Skourtopoulou 2001; Tsagouli 2002). The most recent study season focused on completing the technological and typological analysis of all chipped lithics from ‘Area 5’ and the ‘Open Areas’ to the East and North. These areas together comprise 587.5m2 and include building remains and several pits and trenches belonging to the Middle Neolithic and Late Neolithic I & II. All the lithics – 1567 pieces – have been analysed from this part of the excavation (Table 1). This figure includes surface finds from the plough zone, which possibly belong to AVGI III (Late Neolithic II) and/or a later, destroyed LN II horizon. Although all lithics have been subjected to full analysis, the study focuses on the pieces collected from secure contexts (Table 1). The first undisturbed layer below the plough zone in the western sector is layer 2, which in many areas of the western sector is quite thick. In Area 5, this layer generally covers the burnt and well-preserved architectural remains of Avgi I (layer 3) and their floor deposits (layer 4). The heavy residues from flotation of soil samples taken during the excavation have produced a variety of cultural remains (bones, stones, plant remains). The chert fraction sorted out from these residues number 1442 tiny pieces of debitage smaller than 1 cm2 as well as 171 pieces larger than 1 cm2 (the latter have been included in the full-scale analysis of the macrolithics) (Table 1). Lithic microrefuse recovered from excavations will mostly be found in its area of production, and patterning in its spatial distribution may indicate spatial patterning in the performance of the activities that produced the lithic microrefuse. Table 1. Analysed lithics from Area 5 and the open areas E and N of Area 5. The vast majority of lithics from Avgi are chert, and pieces that macroscopically resemble obsidian make up a negligible fraction of the assemblage (less than 0.9%). The cherts vary considerably in colour and texture, but not significantly in quality. Examination of remaining cortex on the Avgi cherts indicates that at least some of the specimens were collected at a secondary source where they have been subject to mechanical weathering. This is important since such sources can contain a variety of chert types from a range of geological contexts. Petrographic analysis indicates that this source (or alternatively: several sources) mixes chert from several geological formations. With the abraded cortex on some debitage, this points to deposits from a high-velocity river, most likely the nearby Aliakmonas where pebble deposits from the river might have been exposed in the Aliakmonas valley at some point in the past [Fig. 1]. Unfortunately, surveys of stream/river transects within the valley have failed to produce cherts suitable for tool production. Only a few quartzites, re-silicified limestone and some radiolarite (?) cherts of extremely poor quality were found. The initial impression from the assemblage was that the Avgi inhabitants were not involved in the reduction of chert cores to any significant degree and were instead importing ready-made blade tools or prepared cores from non-local producers. There appeared to be few cores and little evidence of their preparation, as well as few fully cortical flakes [Fig. 2]. Preparation of a guiding crest is a necessary step in the reduction process when knapping large cores, but the Avgi assemblage has so far produced very few secondary series blades with remains of cresting – an absence that is noteworthy in light of the heavy reliance on prismatic blades at the settlement. While most blades are fractured or intentionally sectioned into sickle elements, it is clear from their general shape and width that the original blade blanks must have been relatively long. Such blanks are very rare at the site. The platform remains on the blades show that core platforms were facetted by flaking, undoubtedly to create a better flaking angle for the blade removals. This indicates some degree of effort and skill on the part of the knapper, local or not. Despite the above observations, the presence of cortical flakes in the assemblage [Fig. 3, 4] suggests that reduction indeed was practised at Avgi, with at least some of the material relating to core decortication/preparation and not just to core correction and rejuvenation. It is still unclear what the near-absence of crested blades/flakes from Avgi means. Did local knappers produce blades in a manner that involved limited technical investment in the preparation and reduction of blade cores? Was it because they were reducing only short cores? It might also be suggested that the limited evidence for the cresting of cores indicates a relatively low level of skill among knappers at Avgi. At least some ad-hoc knapping took place within the settlement. This involved limited decortication of both pebble cherts and tabular cherts of unknown provenience. These contributions could have been the result of exchange or procurement trips inside or outside the Aliakmonas valley. Some bladelets were produced within the settlement, but with limited technical investment. The majority of prismatic tool blades were imported to Avgi from producers outside the valley, perhaps as prismatic blade cores or as blades already sectioned into shorter sickle elements. 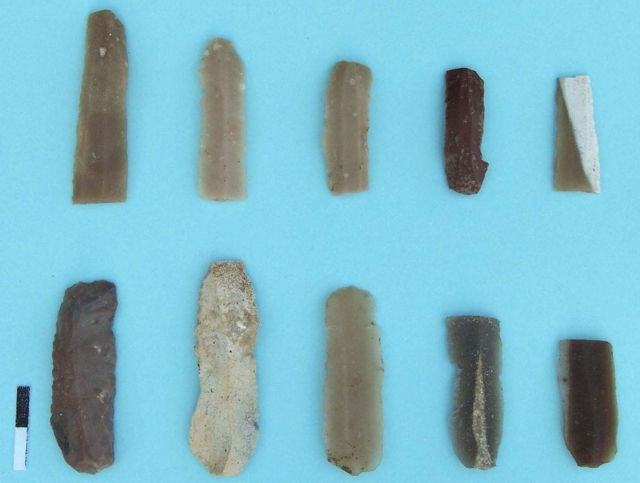 The lithic tools from Avgi closely reflect the activities which one would expect to find at a permanent agricultural settlement. Taken as a whole, the assemblage contains a very high percentage of tools (almost a third of all lithic artefacts). Furthermore, 19.3% of the non-retouched blades and flakes exhibit macroscopically visible usewear. In other words, one third of the examined artefacts show some kind of use. Most tools seem to be best suited for cutting and scraping. Almost all are too small to have been used without hafting, and many (such as blade segments) were probably combined to form composite tools. Many blades have characteristic lustre (‘sickle gloss’) along one or two working edges, which possibly was produced by intensive cutting of vegetal material. In the absence of microscopic usewear analysis, this designation can be justified only because the implements share resemblance to ‘sickle blades’ from other archaeological sites, which have been subjected to microwear analysis. The most common class of tools is retouched blades. In fact, 80-90% of the retouched tools are made on blades. Most of them have semi-abrupt retouch along one or both lateral edges. A few blades have a denticulated edge and others have notches or distal retouch. Blade borers are common and make up 19.4% of the blade tools. The few flake-based tools mostly consist of borers, scrapers, and flakes with simple retouch on one edge. Bifacial reduction technique was used exclusively for production of carefully shaped bifacial arrow points in a variety of shapes (most are symmetrical, stemmed points) [Fig. 5]. They were made from small conveniently shaped flakes or blade segments by pressure flaking, by removing chip-size bifacial thinning flakes along all edges. The bifacial arrow points are examples of weapons, intended either for hunting or for warfare (Runnels 1985, 381). An important aim is to explore lithic spatial distribution patterns throughout the excavation and the relationship of these patterns to structures and features at the settlement. An examination of the spatial distribution of lithics on the investigated part of site split the lithic proveniences between Area 5 and the two open areas (including only lithics from layers and features below the plough zone). The three areas do not greatly differ one from another in the frequencies of major debitage types and it is not possible to point to an area where knapping is more intensive (Table 2). When viewed at the level of individual tool types, however, there are some noticeable differences between the three areas. Table 2. Relative frequencies of technological types at Area 5 and the Open Areas East and North of Area 5. It requires further examination of the horizontal and vertical stratigraphy to substantiate a claim that these differences in the frequencies of tool types reflect localised activity areas, such as re-tooling of agricultural harvesting implement in the open area to the East and drilling / perforating activities (e.g. leather and wood work) in Area 5. Moreover, intra-site studies are difficult to interpret because both ethnographic and archaeological studies have indicated that sedentary peoples usually discard materials away from the places they are used, especially if it is sharp and potentially hazardous objects. Table 3. Relative frequencies of tool types at Area 5 and the Open Areas East and North of Area 5. As regards the vertical stratigraphy, it is noteworthy that truncated and notched flakes, flake borers, end scrapers and pièces esquillées are absent from layer 2, but occur in the plough zone. Analysis of the adjacent excavation sectors may confirm whether this pattern is genuine and therefore could represent a chronological trend. There must have been an emphasis on cereal exploitation as the pattern of modification of blades is generally restricted to truncation and uni- or bilateral wear/retouch of a sort that can be attributed to their use as cutting tools. The presence of sickle gloss along the utilized edges of both retouched and unretouched blades indicates that they were used as reaping implements. It is interesting to note that the archaeobotanical analysis at Avgi has recovered representative samples of cereal-producing agriculture of which some samples have proven extremely rich in carbonized cereal remains. Many blades appear to have been specially modified (truncated or intentionally broken) to be hafted as sickle elements. Many of the sectioned blades would originally have been much longer and an example (although exceptional) is an 81mm long prismatic blade from layer 3 in Trench 282. This, with a small group of prismatic blades over 60mm in length, may well have served as hand-held sawing or cutting tools but were more likely hafted as sickle-elements along with the shorter fragments. Dimitriadis, S. & Skourtopoulou, K. 2001. Characterization of lithic materials by petrographic and SEM techniques: towards suggestions of chipped stone provenance from Neolithic sites in northern Greece. In, Bassiakos, Y., Aloupi, E., Facorellis, Y. (eds. ), Archaeometry issues in Greek Prehistory and Antiquity, Athens, 6-10 November 1996, pp. 779-791. Hellenic Society for Archaeometry and the Society of Messenean Archaeological Studies. Runnels, C. 1985. The Bronze-Age flaked-stone industries from Lerna: A preliminary report. Hesperia: The Journal of the American School of Classical Studies at Athens 54, 357-391. Tsagouli, Chr. 2002. Τα λίθινα λαξεμένα εργαλεία. In, G. H. Hourmouziadis (ed. ), Dispilio, 7500 Years After, pp. 145-154. Thessaloniki: University Studio Press. Fig. 1. Two decortication flakes with small amounts of remaining cherts from Layer 2 in the open area North of Area 5. Fig. 2. Selection of cores. Fig. 3. Tested river nodule with worn cortex. Fig. 4. Chunk of chert raw material. Fig. 5. 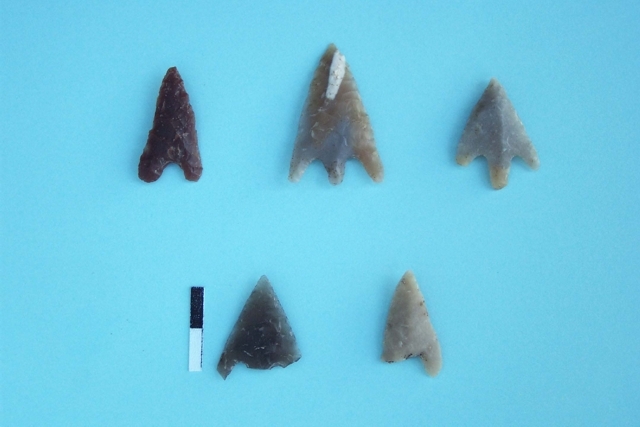 Bifacial projectile points from the studied part of the West Sector. Fig. 6. Representative blade borer (upper left) and truncated pieces from Layer 2 of the open area East of Area 5. Fig. 7. Piercers and borer with and without usewear. Fig. 8. Prismatic blades of various raw materials. The motivation for studying the chipped stone artefacts from Avgi is to investigate the utilization of chert during the Late Neolithic of this area of Northern Greece. The study aims to clarify issues regarding raw material procurement as well as provide insight into the site’s organisation and use of space. It is also intended that the study provide data concerning resource exploitation comparable to that from other Neolithic sites from the wider region (Dimitriadis & Skourtopoulou 2001; Tsagouli 2002). So far, 1481 chert artefacts were examined during the 2008 field season. 1036 pieces are from the East Sector and 445 pieces are from the West Sector. The lithics analyzed so far from both sectors are almost exclusively from the upper (partly disturbed) layers of the settlement and were therefore retrieved without close reference to architectural or other domestic features. Nevertheless, the plough-zone sample provides an interesting overview of the range of raw materials, debitage, and tool types occurring within the upper and most recent deposits of the settlement (the late Late Neolithic and the early phases of the Chalcolithic ~4900/4800-4500 cal BC). The aim of the recording of the assemblages was to catalogue all the major units of the reduction sequence including raw materials, the cores, debitage, and tools. All materials were examined irrespective of whether they were complete or broken, although they were recorded as such. Chipped stone artefacts may be divided into two main groups: retouched tools and unretouched debitage. Taken as a whole, the Avgi assemblage contains a very high percentage of tools (almost a third of all lithic artefacts). Furthermore, 12-14% of the non-retouched blades and flakes exhibit visible usewear. In other words, one third of the examined artefacts show some kind of use. Most tools seem to be best suited for cutting and scraping. Almost all are too small to have been used without hafting, and many (such as blade segments) were probably combined to form composite tools. Many blades have characteristic lustre (‘sickle gloss’) along one or two working edges, which possibly was produced by intensive cutting of vegetal material. The most common class of tools is retouched blades. In fact, more than three out of four of the retouched tools are made on blades (76%). Most of them have normal, semi-abrupt retouch along one or both lateral edges. Some blades have a denticulated edge and others have notches or distal retouch. 7% of the blade tools are borers and 8% are end-scrapers. Only a couple of burins (primarily for bone- or woodworking) are present. In contrast to the blades, flake-based tools mostly consist of borers, scrapers, and flakes with simple retouch on one edge. Bifacial reduction technique was used exclusively for production of carefully shaped bifacial arrow points in a variety of shapes (most are symmetrical, stemmed points). They were made from small conveniently shaped flakes or blade segments by pressure flaking, by removing chip-size bifacial thinning flakes along all edges. The bifacial arrow points are examples of weapons, intended either for hunting or for warfare. 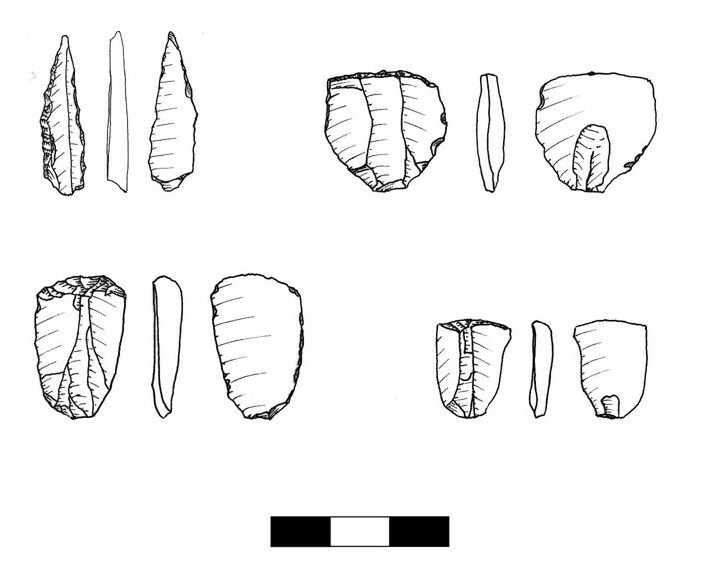 An overall high frequency of tools, as well as general scarcity of cores and debris, indicate that chertknapping was not one of the major activities of occupants of the site. Or, to put it more precisely, not much chertknapping was going on at Avgi itself. Instead, people at Avgi seem to have imported their raw materials. Most of it was brought to the site either in the shape of prismatic blade cores, or as already finished blades. The cultural deposits at Avgi thus mainly consist of damaged or abandoned finished imports and the waste from reduction of imported cores. The supply of non-local materials was related to particular strategies that are still largely unknown. These contributions must have been the result of exchange or special trips further afield. In sum, the lithic tools from Avgi closely reflect the activities which one would expect to find at a permanent agricultural settlement. Many artefacts, which appear to be finished tools, can be assigned the provisional functional term ‘sickle blade’. In the absence of microscopic usewear analysis, this designation can be justified only because the implements share resemblance to ‘sickle blades’ from other archaeological sites, which have been subjected to microwear analysis. The exploitation of lithic raw material resources at Avgi is investigated in interdisciplinary cooperation with geologist-petrographer Vasilis Melfos. Our aim is to locate and document chert raw material sources in the region around Avgi and, if possible, sources located even further away. Subsequently, we will compare material from the sources with tools and debitage from the archaeological contexts. We will also analyze a group of artefacts that macroscopically resemble obsidian to confirm that they are of volcanic origin. If this is the case, a close examination will also inform us about the source, e.g. the Carpathians, the island of Melos in the Aegean, or elsewhere. Furthermore, the assemblage from Avgi will in 2008/2009 be part of a wider inter-disciplinary investigation under a Wiener Laboratory Research Fellowship held by this author, titled “The influence of availability and accessibility on direct-access exploitation of siliceous rock in Late Neolithic and Bronze Age Greece: a petro-archaeological study”. This project examines how the availability of local lithic raw material sources affected patterns of procurement in communities in Greece during the Late Neolithic to the Middle Bronze Age. It is an attempt to use small-scale raw material surveys and petrographic thin-section analysis to advance understanding of 1) how communities in different environments outside the main obsidian distribution network organised and developed procurement of siliceous rocks, and 2) how aspects of availability and accessibility of raw materials affected the organisation of lithic production strategies at the settlements.